I’m taking my time getting back to the novelists. 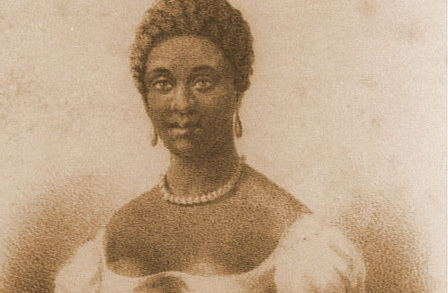 Today, I’m swinging back to one of, if not the, first African-American poet, Phillis Wheatley. Phillis Wheatley’s name, as with so many slave names, unintentionally mapped her history. Phillis was the name of the slave ship that brought her to America; she was only (according to her eventual owner in a 1772 letter) between seven and eight years old. John Wheatley, her owner’s name, became the rest of hers. She apparently learned English at an astonishing rate of speed. And it wasn’t long before she showed abilities as a writer, though it also seemed for some more an amusement (Look, an African can write words!) than art. Thomas Jefferson in particular found her poetry worthless (but seemed, as his affair with Sally Hemmings proved, to have strong opinions on what young African slave girls were for… writing not being among those talents). Looking back, it is easy to criticize Wheatley from the opposite end of the spectrum. With our hindsight we might think of accusing her of caving in to the white narrative regarding her own race and personhood. But that seems more than a bit simplistic to me. Sure she was a product of her culture, just as we are of our own. But she also gently challenged, or at least bent from their otherwise rigidly defined norms, the way in which she and her race were viewed by the white culture she was embedded within. On being brought from Africa to America. Today’s reader will be perplexed by some of the above and annoyed with some as well. The reference “black as Cain” refers to the theologically erroneous belief that when God marked Cain after the latter murdered Abel, He marked him with black skin. Thus, believers in this doctrine drew a corollary that all Africans and/or dark-skinned peoples were offspring of Cain, marked with his mark of sin. The fact that Wheatley accepted such a doctrine isn’t surprising in light of the lack of options she likely had to it. A deeper issue, likely to perplex and irritate readers, is Wheatley’s suggestion that her enslavement is part of a redemptive Divine Mystery. Those waters are too deep for this very white and male human being to go paddling about in. But one thing I do resonate with over the vast expanse of time, race, and gender separating us… meaning and beauty can indeed be drawn from terrible suffering. While I don’t want to fall into the usual patronizing nonsense regarding blackness as victimhood (which those of us white folk who have allegedly “tender” hearts love as a narrative! ), Wheatley’s own words do more than plead. Christianity is subversive of all authority, though the nature of that subversion works from within as often as from without. In fact, the work within is where new birth originates, a new vision and new interrelationship between human and God, human and her fellow-human. Wheatley’s vision was a seemingly passive one, yet not as passive as it seemed. Like the Apostle Paul, so easily misunderstood on the issue of slavery, the message of equality undeniable lies at the heart of things. Impartial Savior? The One who promises not only to American (that is, to white) but also to African slave, “You shall be sons, and kings, and priests to God”? This is the most gentle, whispering subversion. Yet at its core it contains a mustard seed enough to overthrow the greatest darkness of heart this nation ever knew. Wheatley did occasionally let her inmost heart express itself more freely than even this. Attempt to imagine with what care a black slave woman in America had to guard her words when her owners and benefactors were all around her, as well as being her only audience. Then imagine she had only the tools of her captors to express herself with, their thoughts, even their religion (though in truth it was often not their religion–or, to subversively quote Nietzsche, “Christianity is a religion of slaves and women”). Phillis Wheatley’s life after the American Revolution began to unravel. When her master died, she shortly afterward married a freed black man, John Peters. But John eventually left her. In 1784, after giving birth to her third child, Phillis died. Her child died hours later. A complete second volume of poetry had been completed, it is said. But those poems have never been recovered. Perhaps that serves as a metaphor of sorts for not only the life of one brilliant lonely woman, but for the lives of a people who, in each of their unique and individual ways, had to find the words of poets and, in speaking them, discover the strange and lonely path of the prophets. I dare not suggest I know such things. At best, I know of such things. But that of is all the difference between Stephen who, as he was stoned cried out to God, and Paul, who stood by holding the coats of those casting stones. For Paul, there remained the need to be knocked off his high horse and to hear the mouth of murdered Stephen — the mouth of Jesus Christ — sigh out truth and forgiveness. This is the quiet, secret subversion of Phillis Wheatley which is also the subversive love of Christ for even the persecutors of his beloved.